In a surprise move Monday, Republicans in the state House of Representatives elected Rep. Don Bratton of Hobbs as minority leader, defeating current GOP floor leader Tom Taylor of Farmington. The Republican caucus also elected Rep. Nate Gentry, R. Albuquerque as minority whip, replacing Bratton and Alonzo Baldonado of Belen as caucus chairman. The caucus met in Albuquerque Gentry said Monday after the meeting. State Senate Democrats still have a few weeks before they nominate a candidate to replace outgoing Senate President Pro-tem Tim Jennings. Like a good game of Whac-a-Mole, new possibilities keep popping up while others go down before you even get the chance to hit them over the head with a mallet. The last time I wrote about this, there was one contender, Sen. Linda Lopez, D-Albuquerque, who was definite; one, Sen. Carlos Cisneros, D-Questa, who seemed just a hair away from being definite; one, Sen. John Arthur Smith, D-Deming, who said he was considering it; and one who was strongly rumored to be thinking about it, Senate Majority Leader Michael Sanchez, D-Belen. Since that time, Sanchez has announced that he just wants to stay on as majority leader, and Smith told the Albuquerque Journal that he wants to stay on as chairman of the Finance Committee. But Sen. Mary Kay Papen also has thrown her proverbial hat into the ring. 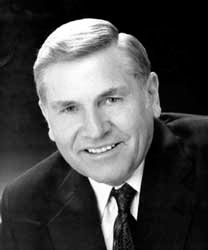 A conservative Democrat from Las Cruces, Papen could go the route Jennings took to win the position. 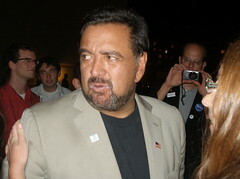 Four years ago Jennings lost the Democratic Caucus nomination to Cisneros for the pro-tem job. But that position is elected by the full Senate, so he cobbled together a coalition of conservative Dems and all Republicans to win when the Legislature convened in January 2009. Jennings, who served in the Senate for more than 30 years, was defeated for re-election this month. The president pro-tem gets to preside over the Senate when the lieutenant governor is away (the lieutenant governor being the official president of the Senate). But the main power of the president pro-tem is getting to name and preside over the Committees’ Committee, which selects committee members and chairmen. That’s going to be a bigger task this year because so many new senators — 15 of 42 members total — have been elected. Coalition politics: If Morales does run, that would mean three of the eight Democrats who joined with Republicans to back Jennings are candidates for Jennings’ job — the others being Papen and Lopez. Senate Republicans will be representing a bigger block than they did in 2009. There were 15 Republicans then, but because of the elections, there will be 17 next year. From the horse’s mouth: Here’s a name you can take off of the list: Sen. Phil Griego, D-San José. I was talking to Griego about a different issue a few days ago when he volunteered this information. “You might have heard that I was running for a leadership position,” he said. “Well I’m not. … There’s rumors out there, but I’m not. You’re hearing it from the horse’s mouth.” Griego said he wants to stay on as the chairman of the Corporations and Transportation Committee. According to the piece by reporter Tony Castro, “Hispanic leaders close to the Obama administration are lobbying the president to name former New Mexico Gov. Bill Richardson as Hillary Clinton’s successor as Secretary of State, according to sources in Washington. “Such an appointment would be historic, making Richardson the highest ranking Latino to ever serve in the federal government,” the story says. Now that we’re done with the 2012 election, it’s high time we move on to more important matters — like the 2014 election. Seriously, people out there in Politicsville are already starting to chatter about what Democrat will be chosen to take on Republican Gov. Susana Martinez. Attorney General Gary King said a few months ago that he is running. Albuquerque lawyer Sam Bregman won’t confirm or deny that he’ll run. A few other names have been bandied about here and there. And such chatter is likely to rise in coming months. But I’m going to make a prediction. Whoever the Dems put up against Martinez will not come from the state Legislature. So why isn’t the Legislature a logical springboard to the governor’s mansion anymore? Maybe it’s because most voters are fairly satisfied with their own representatives and senators, but many tend to think of the rest of the state Legislature as a bunch of clowns or worse. Kind of like the way we feel about our own congressional representatives. Maybe someone in the Legislature will come along, wow the electorate and prove me wrong. If you have any names, let me know. “I’d rather not answer that”: Last week I had some questions about Patriot Majority New Mexico, a Democrat-favoring political action committee that spent at least $1.3 million in the general election. I called Amanda Cooper, who helped run Richardson’s presidential and second gubernatorial campaign. Why Cooper? She’s not listed anywhere as a PAC official. And there’s no salary or any other expenditure to her listed in the committee’s campaign finance reports. But last month, when House Speaker Ben Luján gave Patriot Majority a check for more than $83,000 from his Speaker’s Fund, he listed the PAC’s address as Cooper’s home in Corrales. I’m grateful that Cooper did get me in touch with Craig Varoga, who answered my questions about the story I was writing that day. He’s a Washington, D.C., consultant who is registered as the president and treasurer of the group. 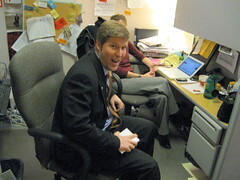 He also worked on Richardson’s presidential campaign. Another major Richardson figure, former chief of staff and campaign manager David Contarino, showed up in an NPR profile of Patriot Majority. But that report was from 2008. His name doesn’t appear on any of the Patriot Majority documents filed with the state this year. Varoga didn’t respond to an email requesting he clear up whether Cooper or Contarino were involved with Patriot Majority New Mexico. Gov. Susana Martinez joins a growing list of Republicans who are distancing themselves from unsuccessful presidential candidate Mitt Romney's comments this week that he lost the election because of "gifts" President Obama gave to minorities, young people and others who voted for his re-election. And then once you've done it, you tell them we did it together." "Republicans need to stop making assumptions, and they need to start talking to younger people, people of color, and ask them—not talk to them—ask them, 'What is it that we can do better? How do we earn your vote? How do we earn the ability for you to see that we can be the party that will make your life better and that of your children?' ... But we can't be the ones that come and tell them how things are going to be and how we have all the solutions." Gov. Martinez Attacked ... From the Right! Americans for Prosperity, the group associated with the Koch Brothers, is at odds with Republican Gov. Susana Martinez over New Mexico's taking part in establishing a state-run clearinghouse to help small businesses and uninsured individuals to find affordable health insurance. “AFP is extremely disappointed in Gov. 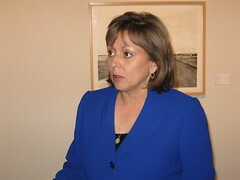 Martinez’s decision to create a health insurance exchange in the state of New Mexico. An exchange will increase insurance premiums on consumers and taxes on hardworking families. Martinez's spokesman Scott Darnell, responded, "Gov. Martinez has always done what she believes is best for New Mexico, regardless of partisan ideology. 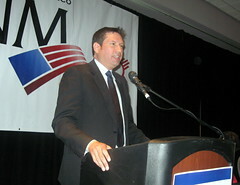 In this case, it is best for New Mexico to develop our own state-based exchange that can address the unique needs and concerns of New Mexicans, rather than waiting for the federal government to impose a one-size-fits-all exchange from Washington, D.C."
Work on the state health exchange has been going on since last year. The statement from Norquist's group might be in response to an Associated Press story today about a possible fight in the Legislature about whether the state needs to pass new laws to create the exchange. About 20 percent of the state’s population lacks health care, and it’s estimated as many as 250,000 New Mexicans may become eligible to buy health insurance through the exchange between 2014 and 2020. 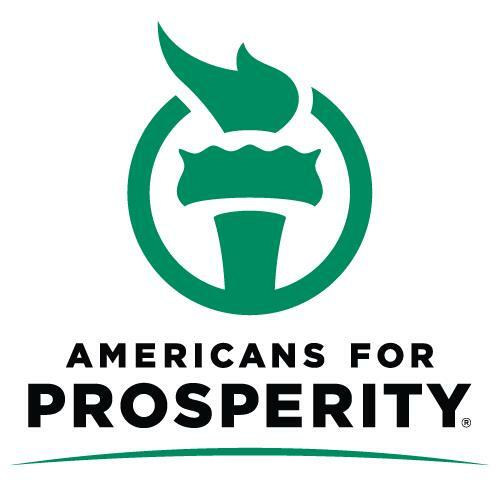 UPDATE 11:45 PM: The original version of this post said Americans for Prosperity was associated with Grover Norquist. His group is Americans for Tax Reform. The text has been corrected. Thanks, Matt. Senate Committee Disappears into Thin Air! True fact: No current member of the Senate Public Affairs Committee will be back when the Legislature reconvenes in January. Here's the deal. Chairwoman Dede Feldman, Vice Chairman Tim Eichenberg (both D-Albuquerque) and members, Sens. Cynthia Nava, D-Las Cruces, Mark Boitano, R-Albuquerque, Vern Asbill, R-Carlsbad and Eric Griego, D-Albuquerque, did not seek re-election. The remaining members, Sens. Mary Jane Garcia, D-Dona Ana and Lisa Curtis, D-Albuquerque were defeated for re-election. If the Senate was hoping for some institutional memory on this committee, they're out of luck. Sen. Sander Rue, R-Albuquerque, I understand, was the first to notice this. UPDATE: 3:44 pm In the original version, I mistakenly called the Public Affairs Committee "Public Works." It's been corrected. President Barack Obama today nominated U.S. Attorney Kenneth Gonzales to the U.S. District Court for the District of New Mexico. If confirmed by the Senate, Gonzales will replace U.S. District Court Chief Judge Bruce D. Black, who retired in October. In a joint news release U.S. Senators Jeff Bingaman and Tom Udall expressed support. Gonzales was one of five names Bingaman and Udall submitted to the White House for consideration after Black announced his retirement. Gonzales is a graduate of Pojoaque High School. He also served as a judicial law clerk to a chief justice of the New Mexico Supreme Court, and was a legislative assistant to Bingaman. 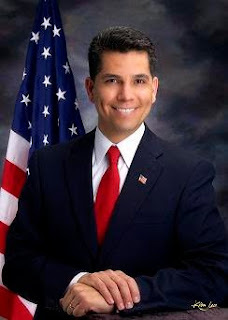 Prior to his appointment to the U.S. attorney position in 2009, Gonzales worked more than 10 years as an assistant U.S. attorney in both the Las Cruces and Albuquerque offices. Gonzales also has been an adjunct professor in the U.S. Army Reserves. He also teaches criminal law at the Judge Advocate General Legal Center & School. ROUNDHOUSE ROUNDUP: New Dynamic in Legislature? All the sound and fury of attacks ads and the millions of dollars spent by PACs and super-PACs are over. And as far as the state Legislature is concerned, what we basically have as the dust settles is a Roundhouse in which Democrats — originally feared to be in danger — end up with a slightly stronger hold on the House of Representatives while not significantly weakened in the Senate. But a new dynamic might be about to unfold. Two Democrats in recent days have told me that they expect the Legislature to start taking the initiative to set the state’s agenda — as opposed to the governor taking the lead in coming up with legislation, as has been the case in recent years. Gonzales said that while Republican Gov. Susana Martinez was successful in her quest to defeat Senate President pro-tem Tim Jennings, D-Roswell, she failed to take out her other major target, Majority Leader Michael Sanchez of Belen, and had weakened her relationship with the Legislature as a whole. Of course, the Legislature always sends lots of bills of its own to the governor, who can sign or veto what she pleases. But Keller noted that starting with Gov. 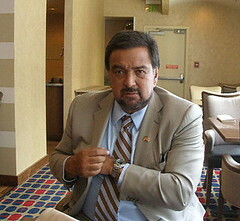 Bill Richardson in 2003, the governor’s agenda became the primary focus of legislative sessions. Gov. Martinez has continued that role, Keller said. Generally, she sends bills down to the Legislature, which, in effect, “signs” or “vetoes” her proposals. Indeed, because of retirements and election defeats, there will be 15 new senators (that’s more than a third) and at least 20 new members of the 70-member House (the numbers there aren’t final yet because of a pending recount in one race). But even if the Legislature seizes the agenda, there’s one inconvenient constitutional fact. The governor has the power to veto. Gov. Gary Johnson took pride in vetoing hundreds of bills. And when he ran for re-election in 1998, that sure didn’t hurt his popularity. So we might just end up with a different kind of Roundhouse gridlock. You can’t go home again: Two former House members from Las Cruces, Nate Cote and Jeff Steinborn, are getting second chances in the Legislature. Both Democrats lost in the Republican sweep of 2010 but were successful this time. Cote defeated Ricky Little, the Republican who beat him two years ago. However, three Albuquerque senators attempting to make a comeback fell short. Shannon Robinson was a Democrat who switched to Republican (although we know that in his heart, he’ll always be a “Bull Moose,” as he sometimes described himself). He lost to Keller, who beat him in the 2008 Democratic primary. Joe Carraro, a former Republican, changed his registration to declined-to-state. He was defeated by Republican John Ryan. We declined-to-states might be the fastest growing segment in terms of voting registration in the state, but we didn’t do well at the ballot box Wednesday. 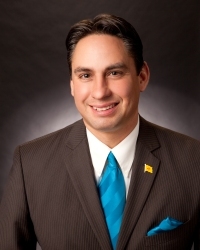 The only other independent running for Legislature, Rep. Andy Nuñez of Hatch, came in third in the District 36 race, losing his seat to Democrat Felipe Archuleta. The third former senator to loose a comeback bid was Diane Snyder. She lost her seat in 2008 to Democrat Tim Eichenberg. She lost Tuesday to incoming freshman Daniel Ivey-Soto. UPDATE 6:17 pm. State Election Bureau director Bobbi Shearer just called to say that in the District 37 race Ferrary now leads McMillian by one vote, Bobbi Shearer just said. She said they found two more provisional ballots that had one vote for Ferrary and one without a vote in that race. This race still isgoing to recount. I just spoke with state Election Bureau director Bobbi Shearer who told me that all the absentee and provisional ballots have been counted in the state House race between incumbent Republican Terry McMillan and Democrat Joanne Ferrary ... and it's a tie. It's been known since election night that the District 37 race was heading for an automatic recount. Unofficial results initially showed Ferrary with a 12-vote lead. But once local election officials started counting absentee and provisional ballots, Ferrary's lead began shrinking. Shearer said the state will canvass the vote, then the recount will begin. Shearer said she was not yet certain about the final count for Sandoval County. UPDATE: As stated above, the McMillan/Ferrary race number is not final. However if this remains a tie, it would be the first legislative race since Bill Payne, now GOP Senate whip, won his first race by a coin toss in 1996. 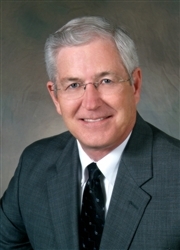 Jay McCleskey, Gov. Susana Martinez's political consultant, wouldn't talk to me last week for my profile of him in The New Mexican. But he did talk to Matt Grubbs on KNME's In Focus, which airs tomorrow night. On the clip below, he acknowledges this year was a tough one for Republicans in this state. He also talks about how the Albuquerque-area 1st Congressional District -- in which Democrat Michelle Lujan Grisham handily defeated Janis Arnold Jones -- has grown more Democratic in the last 10 years. Republican Heather Wilson held the seat for 10 years, but by 2006 (an even worse year for Republicans almost everywhere) Wilson hung on by less than a thousand votes. According to the KNME press release, on the program tomorrow, McCleskey will discuss "campaign tactics, the changing face of the Legislature, the impact of independent political committees on the election, & what's in store in January." It airs 7 p.m. on Channel 5. UPDATE: 11-12-12 9:57 am: I just replaced the teaser with the entire 15-minute interview. Roswell area farmer Cliff Pirtle, aided by Gov. Susana Martinez, was successful in defeating Senate President Tim Jennings yesterday. Republicans gained a total of three seats in the state Senate. But Republicans blew a chance to take control of the House. Democrats actually increased their strength in the House by a net gain of two seats. That'll be three if Republican Rep. Terry McMillan of Las Cruces is defeated. Unofficial results show him 12 votes behind Democrat Joanne Ferrary. There will be an automatic recount in that district. Apparently Stephanie Garcia Richard's lead held over incumbent Republican Jim Hall of Los Alamos. Unofficial results show her 310 votes ahead of Hall. Despite their losses in the Senate, Democrats still will hold a healthy 25-17 lead over Republicans in that chamber. And with Jennings gone, chances are the next president pro-tem will be a lot more liberal. Jennings, after all was first elected to the post with the support of all Senate Republicans. Among the incumbents who were defeated yesterday was Democratic Whip Mary Jane Garcia of Dona Ana. She was the subject of an ethics investigation this year over possible campaign finance violations. She paid a $1,200 fine to the state. Also appointed Sen. Lisa Curtis, D-Albuquerque, who spent about a quarter of a million dollars, couldn't buy her seat in her heavily GOP district. She lost to Mark Moores, former chief of staff to Lt. Gov. Walter Bradley. In the House, the only registered independent, Rep. Andy Nunez came in third in his race, losing to Democrat Felipe Archuleta. Nunez was attacked by both Democrats and Republicans, including Gov. Susana Martinez's Reform New Mexico Now PAC, even though Nunez had been allied with the governor on her driver's license bill. Other incumbents to be defeated were Rep. Ray Begaye, D-Shiprock, who lost to Republican Sharon Clahchischilliage (Bad news for reporters who now have to learn how to spell "Clahchischilliage"); Ricky Little, R-Las Cruces, who lost to former Rep. Nate Cote (who lost to Little in 2010); and Rep. Conrad James, R-Albuquerque, who lost to Democrat Elizabeth Thompson. Most Santa Fe area legislators were unopposed. Longtime Rep. Lucky Varela, D-Santa Fe won 80 percent of the vote against Libertarian Bob Walsh. There will be some new local lawmakers however. Besides Richard, Democrat Stephen Easley won the seat held for 14 years by Rep. Rhonda King, who didn't seek re-election. And Carl Trujillo of Nambe, who won his primary race and faced no general election opponent, will fill the seat held by retiring House Speaker Ben Lujan. That's according to Denise Lamb, Santa Fe County's Elections Bureau director. 35,936 is the number of early, in-person voters. In addition, the county has received 5,760 absentee ballots so far. That number will undoubtedly rise, however because nearly 1,100 absentee ballots that were issued have not come back yet. The number of early voters is slightly behind the total in the last presidential election. In 2008 the day before the election County Clerk Valerie Espinoza reported 37,383 people had voted early in-person and 15,391 at that point had voted absentee. Lamb said in the 2008 general election voter turnout in Santa Fe County was 72 percent. According to the Secretary of State's website, there are 99,511 registered voters in Santa Fe County as of Oct. 31. Is this the rehabilitation of Bill Richardson? Ever since early January 2009, when Richardson had to withdraw his nomination as secretary of Commerce because of a grand jury investigation dealing with possible “pay-to-play” campaign contributions and state highway project bond funds, Obama has kept him at arm’s-length. True, Richardson was invited to a state dinner or two at the White House, but you haven’t seen him as a campaign surrogate for Obama. 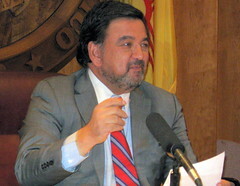 As it turned out, neither Richardson nor any of his administration involved in the investigation were indicted in the scandal over the program known as Governor Richardson’s Investment Partnership — though the U.S. attorney noted that decision came from the U.S. Department of Justice in Washington, D.C., not the Albuquerque office. Another grand jury investigation into state investments, reportedly begun years ago, also hasn’t produced any indictments. 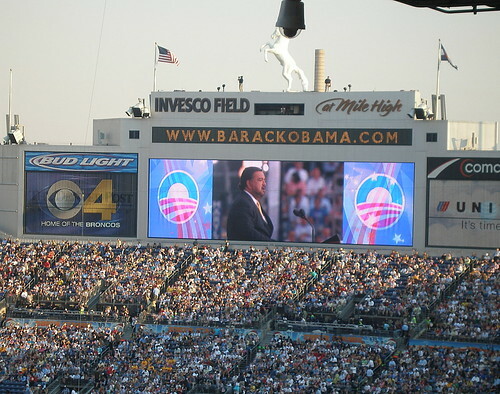 This new announcement reminded me of a day in May 2009, when Obama spoke in Rio Rancho. It was the first time the president had met with Richardson face to face since the Commerce withdrawal. Richardson later told reporters that he’d had a “very brief” one-on-one encounter with Obama before that speech. He said they didn’t talk about the Cabinet nomination. Beginning in 2009, Richardson’s approval ratings in the state took a nosedive, and many have said that was a huge factor in Lt. Gov. Diane Denish’s loss to Susana Martinez for governor the next year. It’s not clear when New Mexico Democrats will ask Richardson to campaign for them here. Our celebrity govs: The Richardson announcement means that we have had three New Mexico governors out on the campaign trail this year. Martinez, in recent weeks, has been a Romney surrogate in swing states such as Colorado and Nevada, which have large Hispanic populations. Former Gov. Gary Johnson has been all over the place in his quixotic quest as the Libertarian Party presidential nominee. Strummin’ on the old banjo: Maybe it’s because she has been so far behind in all the polls — except for her own — that Republican U.S. Senate candidate Heather Wilson has dared to do something I haven’t seen any other candidate in New Mexico do — run an ad that makes her look fun and a little goofy. I’m referring, of course, to Wilson’s recent “banjo ad” featuring her two teenage kids, Josh and Caitlin. It shows Wilson playing the banjo and home-movie footage as a child riding a unicycle. From the start of this campaign, Wilson has tried to soften her image. We’ve seen her choke up talking about her childhood in one previous spot. But the banjo commercial is one designed to make you smile. And the banjo’s not just a prop. In 2007, I revealed in this very column that Wilson played banjo. I learned this from Al Hurricane — the godfather of New Mexico music — who told me that he and Wilson had been at a presentation for students at an Albuquerque middle school, and she joined him on banjo for a song. I first reported that Republican U.S.Senate candidate Heather Wilson played the banjo back in 2007. My source for this crucial information: the godfather of New Mexico music, Al Hurricane. Some folks who weren't around back then have looked at me in disbelief when I've mentioned that. But the Wilson campaign itself redeemed me when they came out with their recent ad showing Wilson plucking away on the old banjo. And now the campaign has released this photo featuring Wilson jamming with the godfather himself. Not showing favoritism here. If anyone has a photo of Martin Heinrich playing accordion with Joe West or something, please let me know. Ever since then-Gov. Bill Richardson had to withdraw his nomination as Secretary of Commerce because a grand jury investigation dealing with campaign contributions and a state highway project, President Obama has kept an arm's-length from him. Sure there were one or two invites to a state dinner at the White House, but you haven't seen Richardson as a campaign surrogate for Obama. Gov. Bill Richardson will be in Miami and Orlando, Florida on Friday, November 2nd to take part in early vote rallies for President Obama. He will also appear on Network and Cable channels this weekend leading up to the Election Day in support of the President’s campaign.